Shortly after launching her career in general medicine more than 25 years ago, Dr Frances Pitsilis developed an interest in stress as she realised that the majority of illnesses are related to it. About 12 and 15 years into her general practice life the interest in stress became personal when Frances twice experienced and recovered from burnout. She decided to combine her study of stress with her interest in communications, and achieved qualifications in occupational medicine and training in professional speaking. Her other qualifications include Nutritional Medicine, a Diploma of Obstetrics, a Diploma in Occupational Medicine and is a Fellow of the Royal NZ College of GP’s. During 2009 /2010 she will have completed international qualifications in Preventative and Regenerative Medicine. Within her career Dr Frances also held several positions of responsibility within her profession including serving on the local branch of the NZ Medical Association and being a Chairperson of the local after hours medical service. Dr Frances’ medical practice now involves second opinion and consulting work on stress, pain, fatigue, and complex conditions including hormonal and shift work-related problems. She takes an holistic approach and uses evidence-based natural and complementary therapies and lifestyle interventions where appropriate. Dr Frances also has a strong following of corporate clients, provides stress-related illness consultations to employers and their staff. As a professional speaker, she presents her own workshops and seminars, discussing diet and lifestyle, stress management, and herbal and hormone therapies. For the past seven years, to balance her general practice and stress work, Frances has practiced cosmetic and appearance medicine. She initially only used Botox for chronic pain and this progressed to offering Botox, Fillers and treatments with a medical-grade laser and light machine at her Skinfresh Clinic. Dr Frances works part-time in this area and is assisted by two nurses. Despite her busy work life, Dr Frances enjoys educating the public about stress and life management and holistic health through her speaking, training and media work. She is the Coast Radio Doctor, and was the weekly resident health expert on TVNZ’s Breakfast and regular on Kerre’s Café, on Newstalk ZB radio. 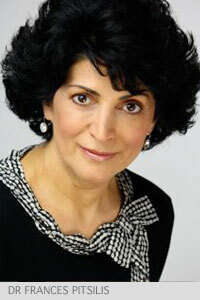 Dr Frances also written for and lectured to the beauty and anti ageing industry both in NZ and overseas. To keep herself up to date with the global health industry Dr Frances regularly researches local and international medical literature and attends many conferences, both local and abroad. As a result you have someone who is right on the international pulse of research in health and disease treatment and prevention.